There's a difference between making something connected because it's possible and making something connected because it's practical. Well, gang, it's finally happened: We've made it past the point of no return. The notion of hardware being "smart" has, as tech-lovers love to say, officially jumped the shark. It's been headed that way for some time now, of course. But while we've been watching it wobble with random goofy gadgets for a while, this year's CES convention in Vegas has taken the balance and slammed it firmly downward in the direction of silliness. The main culprit? Samsung's Family Hub Refrigerator -- a "smart" fridge (oh yes) that comes with three cameras (uh huh) and a built-in Internet-connected tablet (yup). It'll cost $5,000 (no joke) and will be available to anyone with lots of expendable income (cha-ching) and very little good judgment (durrr) sometime this spring. The concept is novel, to be sure, but it's also a new extreme of making something connected for the mere sake of making it connected -- and thus creating a "smart" appliance that's more gimmicky than practical and spattered with troubling asterisks. Let's examine this a bit more closely, shall we? 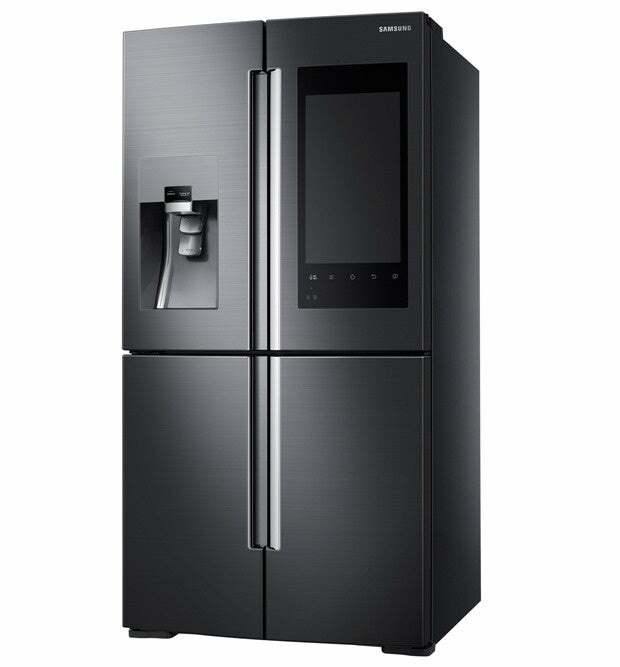 The selling point of the Family Hub Fridge is that it'll make your kitchen modern and convenient. Sounds sublime, right? In theory, sure. 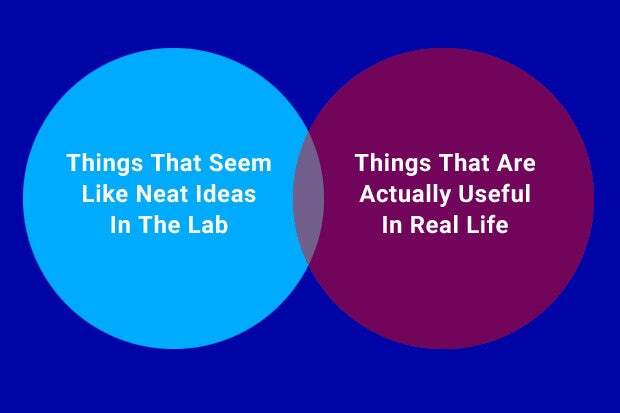 But the problem, as I pointed out on Twitter earlier this week, is that there's a difference between something sounding neat on paper and something actually being useful in real life. And it seems safe to say Samsung's "smart" fridge falls firmly into the former category. Oh, JR, you're just being surly! Maybe. I do have such tendencies, after all. But initial "neato!" factor aside, this concept really does present some serious issues. So get into them already, then, you rambling goat-stalker! The core issue with Samsung's "smart" fridge is that it's integrating hardware and software with short shelf-lives into an expensive appliance that should last a solid 13 to 17 years (according to a variety of news articles about refrigerators, which I actually looked up while mulling this subject -- the things I do for you!). On the hardware front, think about how different a tablet today is from one you would have bought five years ago. Now think about the fact that the tablet in the Family Hub Refrigerator is stuck there eternally, even as standards and expectations invariably evolve. And on the software front, think about how much trouble Samsung has keeping its phones and tablets up to date with new releases over time. Do you honestly think the company's going to be sending timely OS upgrades and security patches to your refrigerator -- a product that's sure to sell in far lower numbers than its already-update-challenged smartphones and tablets -- two years from now? What about six years from now? Or 10? Security implications aside -- and that's no small cookie to consider -- outdated software could result in key features failing to work as interfaces evolve over time. It's a struggle owners of previous (albeit less ambitious and less high-profile) Samsung "smart" fridges have already complained about, and it seems all but inevitable at the rate such areas progress. Uh, so what exactly are you saying here? Here's what it boils down to: This sort of "smart" appliance isn't being created because it's useful or practical for families. It's being created merely because it's possible -- and potentially profitable (especially if manufacturers manage to convince shoppers to "upgrade" and get new models more frequently than they do now). The benefit here is almost entirely for the manufacturer, in other words, and it comes at the cost of the consumer. Wait a minute, muchacho. You must be exaggerating, right? I mean, this thing is gosh-darned futuristic! And futuristic has to mean cool, doesn't it? It does give good "wow" at first glance -- I'll grant you that. When you really stop and think about it, though, almost everything Samsung's "smart" fridge offers could be accomplished in a more effective manner with a standalone tablet and a cheap stand. Any of those tasks would be more practical and more convenient on a screen that's not permanently stuck to the front of your fridge (and, let's be honest, some of them would be more sensible with good old-fashioned paper and magnets). Crucially, a standalone tablet could also be upgraded and/or replaced over time so it doesn't turn into a poorly functioning and insecure eyesore. For most of us, the question to ask with "smart" products is simple: Why? If you can't figure out the answer -- if the product doesn't do anything that you actually need and that can't be accomplished more simply, effectively, and cheaply in another already-existing manner -- establish yourself as the smart one in the relationship and walk away.